How to play a YouTube clip in background/minimised? The stock YouTube app (here on 2.1-eclair, but applies to all android versions) stops playing when I minimised, switched to another application or even when I lock the phone. And when I resume it restart downloading the clip from the beginning. Is there any way that I can play YouTube clips in the background? Note, I only the audio to continue playing. This new app PVStar+ (Pro Version) is amazing. It allows you to play videos in the background (even if your device screen is off). Another feature which i love is video cache. Saves data when you have to play some clips again and again. Here's a solution using entirely free and open source software. The basic idea is that although YouTube can't play clips in the background, VLC for Android can play clips in the background, so all we need to do is pipe the clip to VLC where we can listen to it minimised. That sounds complicated, but luckily there is software that does it for us. Install NewPipe (either from APK or from the Fossdroid app). Open NewPipe, and in Settings, make sure that Use External Player has a checkmark. Open VLC, and in Preferences, make sure that Play videos in background has a checkmark. Now, when you play a video in NewPipe, on the dialog that appears select VLC player. It will play in VLC and you can do other things while it plays. Play YouTube video using MX Player. Update : Now MX player is not allowing to play youtube videos directly as mentioned by narayanan. You need to download UC browser . Now you have to select option called Play With in top of video player and select MX player. Thats it. It's not currently possible but it should be soon. According to AndroidPolice background audio is coming in a future release of the YouTube app. You can use firefox and request the desktop site. You can change tabs, open other apps, or turn off the screen. However the desktop site layout is not optimal for mobile firefox. This does not work in chrome or the default ("Standard") browser and it will not play videos that require flash (vevo). You can do it in an easy way (without hack). Download a floating browser app like this one: Floating Browser, open the URL (http://YouTube.com/tv) in the popup browser. Use large swipes movement to open the side panel and navigate to the parameters at the bottom. Go to "pair devices" option, keep the code that appear onscreen in the popup browser. Go to your YouTube app, and in the parameters, go to connected devices and enter your code. You will now have a popup browser in which a YouTube player reads the video opened from your YouTube app. You can now reduce the popup to the notification bar, and maybe even hide the notification (it may be hard to get the popup back if you do so. Go to floating browser app info setting page, then force quit and enable notification to revert it). The video will keep playing if you switch app and even if your screen is off. You can even pair remote devices (a tablet, a computer, a laptop... All of them at the same time). This will allow you to remotely control your music from every YouTube-enabled device. Instead of the YouTube app, open YouTube in your standard browser. Then, the video won't pause or stop when you turn your screen off. It will still pause when you go home or minimize, though. You could also use YouTube Vanced. YouTube Vanced is a modded version of YouTube. It is a feature enhanced version of the official YouTube app, most importantly brings the feature for background playback (as well as other equally useful features including built-in adblocking, black/dark themes, etc). It officially supports minimum (API 17) version 4.2 jellybean and works on both rooted and non-rooted devices. This page has installation instructions and download links for non-rooted and rooted devices. Than in download section find youtube background playback module, activate it and than reboot. Enjoy! But beware if your device runs stock rom there is big chance to get bootlop after installing xposed framework. EDIT: ooh, sorry I didn's see that your device is running 2.1 android, and for using xposed framework 4.0+ android is required.. Select a video and start playing. Press home button (ofcourse youtube app will close/minimize). With headphones plugged, stay in the home screen, press play/pause button on the headphone itself. Works for me everytime, but only for playing from browser not from YouTube app. Also I for got to mention, you can sign in and view your feed / and subscription feed and every thing. Play a YouTube video in Google Chrome. Switch to Desktop Mode (Options ~> Request Desktop Site). Hit the Home button to push Google Chrome into background. Pull down notification to find Google Chrome media control. Play the video from here. There's no thumbs down of it as you can still open new tabs in Google Chrome to do another thing. Enjoy listening YouTube podcasts and song playlists while doing other things in smartphone or real world! I'll share 3 methods to play youtube in background and with the screen lock. YouTube - How can i play my youtube playlist in my android phone even my screen automatically goes to sleep mode? How to keep playing online videos when screen is locked? How to play youtube in the background in android? Play audio of flash video while screen is off? How to go to a specific time of a video clip quickly in Youtube? 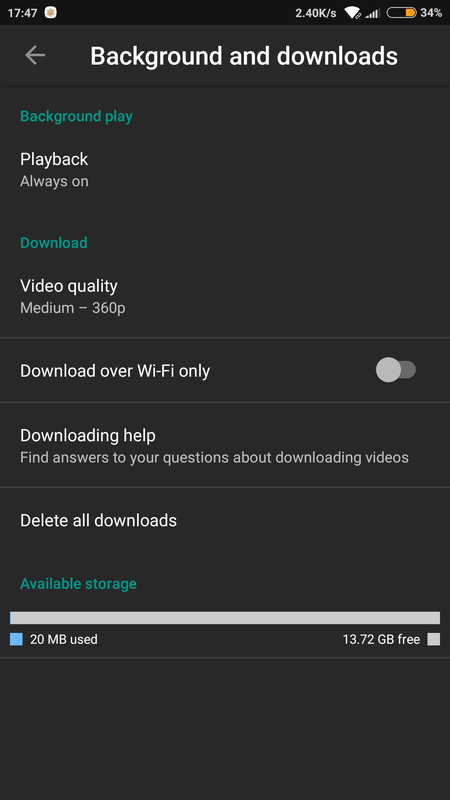 Does QueueTube download complete videos or audio only?